The Memory Travel Core™ pillow is made with 100% viscoelastic foam to provide comfort for people with special sleeping or resting needs. 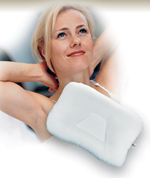 The foam in this neck support pillow responds to your body heat to better conform to the shape of your head and neck. Pillow also helps to stabilize an existing condition. This neck pillow is great for traveling or home use. Foam pillow measures 18 in x 9 in and comes with a plush velour cover.